Fire on the Bluff is my (Barry Madore's) new venture. From the moment we moved to Dayton's Bluff, St. Paul Minnesota's historic East Side urban neighborhood, in December 2013, I've been inspired and encouraged by my new neighbors -- with a persistence I'd not ever experienced -- to pursue my passion for neighborhood development and arts-related projects. As I begin to move some initial project ideas forward, including engaging collaborators and applying for support grants from foundations, I realize that I need a more formal venue to coordinate things. 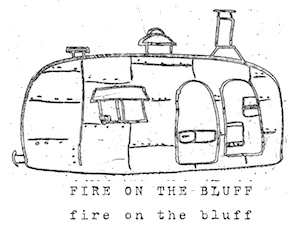 Fire on the Bluff is hereby launched. "Fire" to symbolize energy and passion but also literally relating to the soon-to-be-signature endeavor: a mobile kitchen with a wood-fire oven that I'll be using not just to dole out awesome craft pizza but also as a roving headquarters for neighborhood arts and food-based work I'll be pursuing. "Bluff" because my family feels that we've found the place we're meant to be here in Dayton's Bluff, St. Paul. Fire on the Bluff is committed to focusing on efforts that engage the community starting right here on our block and radiating out to whomever and whereever our connections reach. With an Airstream trailer outfitted with a kitchen, I venture our reach may be virtually unlimited! I'm always seeking new ideas, new energy and, especially, collaborators of all types. Never hesitate to contact me with a question, or better yet, an idea. Keep coming back to this site for news about what we're doing and opportunities to communicate and collaborate. If you're so inclined, feel free to follow one or all 3 of my various Twitter streams -- @bmadder (personal), @fireonthebluff (related to all Fire on the Bluff activity), @radiosanpablomn (Nuestro Pueblo San Pablo radio novelas project specific). Facebook pages coming soon!